Nokia announced on Tuesday its latest smartphone, the multimedia-heavy N8, featuring a 12-megapixel camera and HD video recording. Its hardware specs could make any iPhone user jealous, but as the first phone to feature the latest iteration of the Symbian OS, the N8 will have to prove that Nokia's software is a worthy competitor, too. Available in the third quarter of 2010, Nokia says the N8 will cost just under $500 for an unlocked carrier-independent model (i.e. no carrier subsidy announced yet), and would be able to work on AT&T and T-Mobile's US networks. The Nokia N8 can take photos with its 12-megapixel camera (with flash) and shoots HD videos (720p). It also has a secondary video camera on the front for video calling. You can view your recordings on the phone's 3.5-inch capacitive touchscreen or connect it to your home cinema system via the built-in HDMI port. Connectivity-wise, the N8 features Wi-Fi (b, g, and the speedy n standard), in addition to Bluetooth 2.1. You also get GPS and A-GPS positioning systems, with Nokia's free and complete navigation solution, Ovi Maps. The N8 comes with 16GB of on-board storage (expandable via microSD cards up to 32GB) and also features an FM receiver and transmitter (which will eliminate the need for cables to listen to music from the phone in your car). Nokia's real gamble though, is not with the N8 hardware, but with the operating system delivered on the device. 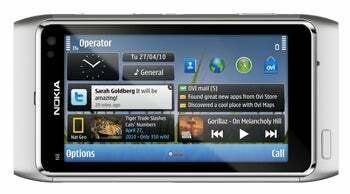 The Symbian OS has been widely criticized for being sluggish, and lagging behind competitors like the iPhone or Google's Android OS. 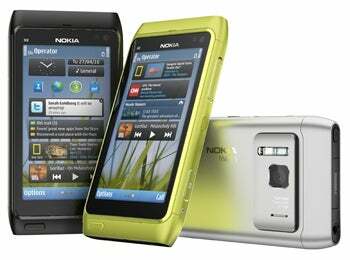 But with the N8, Nokia is putting out its first phone featuring the revamped Symbian 3 OS, which includes several new features, such as multi-touch, flick scrolling, and pinch-to-zoom. Symbian 3 adds several other features found on competing smartphone platforms, like multiple home screens and home screen widgets (similar to Android) for Facebook and Twitter, among others. I haven't had a chance to test the N8 yet, but late last week Russia-based Mobile-Review got their hands on one, and by the looks of it (via Google translation), they were not particularly impressed with Symbian 3, despite the beefy hardware. I will hold back such judgements though, until I get a proper hands-on with the Nokia N8.